Laura and I pulled in to the large parking lot and before we had taken more than a few steps toward the church, I already saw one of the people who had invited me to visit here at some point earlier in the year, Kurt Schaffer. 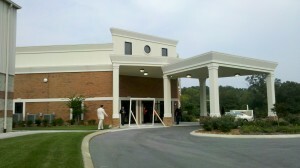 We waved and continued walking up to the church entrance to wait on Kurt and his family so we could greet them. Just outside the entrance of the church there were people on either side holding up large wooden frames, which they were inviting people to stand behind to have a Polaroid (I really didn’t know they still made those) picture taken. This was designed to be a fun lead-in to the “Family in Focus” topic that the church was highlighting for the month of September. Laura and I got our picture, thanked the people who were providing the service, and then headed on in the building after meeting up with Kurt and his family. The lobby area was bustling with activity and as we explored around and were greeted by several people, Laura noticed a basket of earplugs, which was something we had never seen at a church before, but gave us a clue about what to expect. 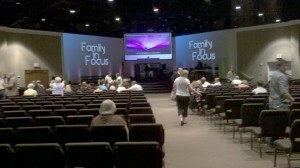 I snapped a couple of quick photos and then we all headed into the sanctuary to get ready for the worship service. Kurt invited us to sit with them and we gladly accepted, thankful for the opportunity to share some fellowship time before the service, which (sadly) does not always happen when we visit churches where we do not know anyone. We sat about midway down the center section of the large sanctuary. The room was typical of most of the modern churches that I’ve seen, with clean and simple construction and most of detail and emphasis placed on the stage area. In this case the stage was divided into sections, with the center having a large projection screen that was mocked up to look like an Apple computer complete with a faux keyboard sitting on top of the clear soundproof plexi walls of the drum kit. A typical contemporary worship band filled out the center stage area with electric instruments and microphones, walled-in by a praise choir of about twenty members on the left section of the stage and horns and other instruments on the right section of the stage. The band blasted off into an up-tempo praise song, producing a full sound with the combination of the band, choir, and horn section reinforcing one another. Now I understood why there were earplugs in the lobby and I noticed several older members of the congregation taking advantage of their benefits. 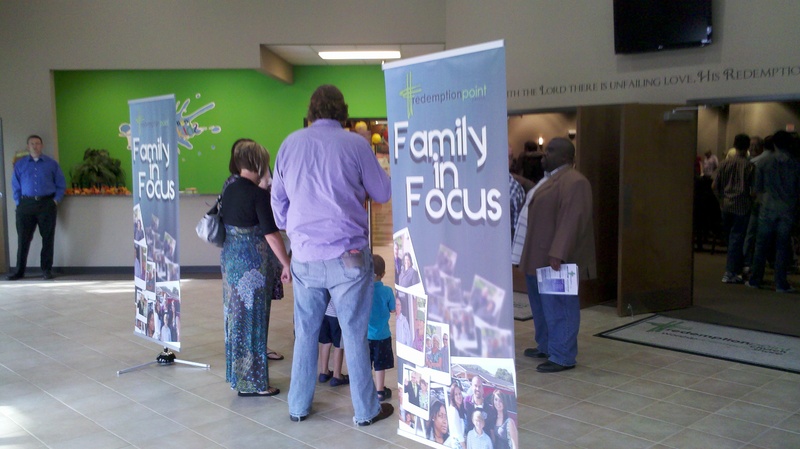 After the opening worship song there were some announcements about the various aspects of “family month” at Redemption Point Church and then everyone was invited to come to the front altar for prayer time or to participate in prayer from your seat. After a time of prayer, all children were invited to the front to lead the congregation in worship as the band launched back into several more praise songs. The congregation was actively engaged in the worship, lifting hands of praise as they sang the lyrics of glorification to the Lord. Multiple prayers were offered up throughout the service, mainly focusing on the topic of families, asking for restoration where it was needed and also the return of prodigal children, and during the final prayer at the end of the service all members of the congregation were encouraged to place their hands on the shoulders of the people on either side of them, which was a unique and powerful experience. Lead Pastor Kevin Wallace then spent a short time edifying the church about their mission work in Uruguay, specifically calling to attention the new property they had just purchased there to serve as their Uruguay missions headquarters. He also talked about additional missions to Guatemala that Redemption Point was actively engaged in and he made it very clear that international missions was something that they would continue to keep as a focal point of their church’s service to the Lord (amen!). During this time the congregation brought their tithes and offerings to the altar at the front (rather than passing collection plates around the room) and Pastor Kevin then introduced a video that the church had created and uploaded to YouTube which had gone “viral”, getting over 100,000 views. The video is titled “Charlie Brown Praise Break” and should give you a good glimpse into both the music at Redemption Point and the preaching style of Pastor Kevin. 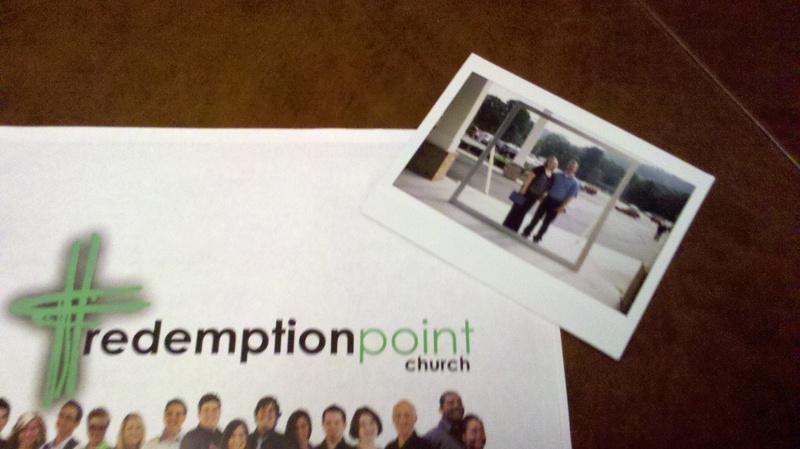 He then noted that at Redemption Point Church they are not into “crystal cathedrals”, but that this church existed to be well-used and that it is probably not the best church to go to if you are uptight. I would tend to agree with him (although this might just be the group of folks to help you loosen up a little). Pastor Kevin began his sermon by reading the majority of Deuteronomy 6 in the King James Version. His voice was loud and raspy, and I felt like this was the essence of what we consider “preaching” in the South…at no point in time during the sermon did he speak to the congregation, he simply preached it. The rising and falling of his voice with various tones of emphasis would peak with frantic auctioneer-like shouts that were only interrupted by equally loud gasps of air, and then taper down to long pauses and soft whispers. Throughout the preaching he would engage vibrato in his soulful vocal style that I would ultimately describe as “speak-singing”, and it was truly mesmerizing. This type of preaching is a craft, and Kevin Wallace is most definitely a skilled artist. The subject matter of his sermon bounced around from point to point on matters such as polytheism, double allegiances, spiritual conversation, education, and the Holy Ghost. He tied most of these issues back to the topic of family, and more specifically, children, and at one point he rationalized that if you treat God and church just like everything else in your life (work, school, sports, recreation) then your kids will think they all have the same level of importance. He then exhorted the congregation that education and attending a good school is not the most important thing for their children….salvation is! All throughout the sermon, many people from the congregation would stand and clap or shout “amen” at Pastor Kevin’s various points of emphasis. He ended the sermon in a roar, walking up and down the aisles with booming shouts of praise and speaking in tongues. It was at this point that I began to understand why Laura and I were here now rather than earlier in the year. The current topic that Laura is researching for a Bible study that she is a part of is speaking in tongues. This topic obviously causes a lot of confusion between denominations and believers in the church today. The differences of opinion vary all the way from one extreme which would be that speaking in tongues is one of the miracles that has ceased to exist, to the opposite extreme which would be that you have not truly been saved unless you have been “baptized by the Holy Spirit” which is exclusively evidenced by speaking in tongues. 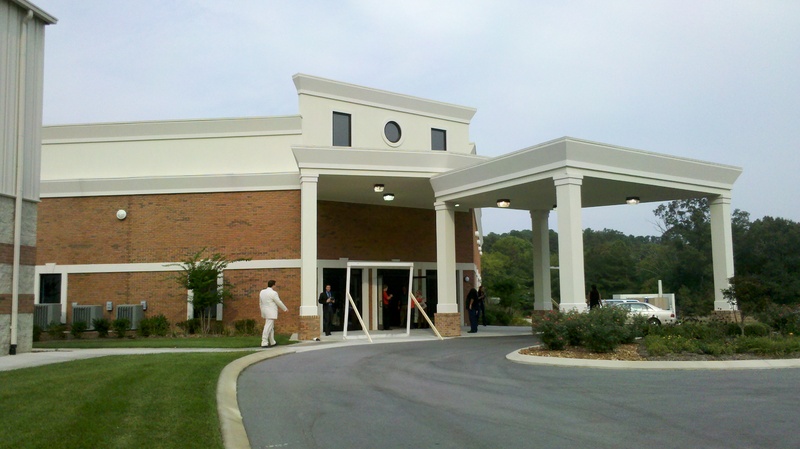 This blog is not a platform for theological debate between differing doctrines, but instead it is about personal experiences at various local churches around Chattanooga, and to that extent this week’s church visit served its purpose in providing an experience at a charismatic Pentecostal church that happened at just the right time for Laura’s Bible study. All I will say about our (Laura and myself) personal viewpoints on the topic of speaking in tongues, is that we rely solely on the Word of God to confirm its existence and to provide the outline of how, when, and why it should happen. I have never uttered a single word in tongues, but I know I have a deep relationship with Jesus and that I am assured of my salvation through Him. I have experienced other miraculous works of the Holy Spirit both through me and around me, and although speaking in tongues has not been one of them, it would not bother me if it did happen…I would thank and praise God for bestowing whatever gifts upon me that He sees fit. For those of you who may believe otherwise, either that tongues and other miracles have ceased to exist or that I am not saved because I have not spoken in tongues, I will not try to tell you that you are wrong, but only that I love you regardless of what you believe. At the end of the day, is not love the ultimate spiritual gift that we should all desire? I believe it is, and I pray that we may all increase in our ability to love and be loved with the Love that only flows from Jesus Christ. Amen. 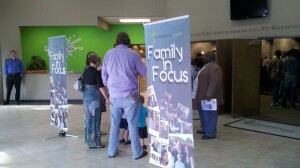 Me and my family also were visiting this very same service, I am in the turquoise shirt in your sanctuary picture! We were visiting family in Cleveland and decided to visit here, AWESOME message !!! Thanks for reading and for the comment Mike and Angie! I don’t know where you live, but be careful visiting Cleveland/Chattanooga too much…you’ll end up falling in love with this place and then you’ll have to move here! So, did you and Laura feel that Redemption Point is living up to their slogan of Aspiring to be the most loving Church in America? I’m a friend of your dad’s and have enjoyed reading your blog. I couldn’t help but notice when you said Laura was doing research on speaking in tongues, or “glossolalia”. A good place to do some scholarly research on this is at Lee University’s pentecostal research center in their library. It is interesting to discover the roots of pentecost in America, and that there do seem to be varying views within the pentecostal denominations themselves. From growing up in the Church of God (Cleveland), I can tell you that the denomination does NOT support the view that having the gift of speaking in tongues makes a person more of a Christian. If you and Laura do visit the library, ask for Wayne Standifer. He is my uncle and a very kind gentleman. He can point you in the right direction for your research. Blessings!